Buschman offers UHMW polyethylene rod holders custom-designed for your application in lengths up to 11.58 meters (456”). Available in a variety of shapes and sizes, our UHMW polyethylene rod holders are manufactured in-house with precision, consistency, and quality from end to end. All Buschman rod holders are fully customized to your needs. Call us at +1 216 431 6633 to discuss your application. We will work with you to design and produce UHMW polyethylene parts to fit your exact specifications, in specialty lengths that can save you money in the long run. Customized: Buschman controls all steps of the UHMW polyethylene rod holder production process in-house. We custom-engineer all parts using state-of-the-art CAD software. Consistent: Highly specialized equipment, designed and built in-house, allows us to accurately control critical dimensions within 0.13mm (0.005in), ensuring that every rod holder you receive will be consistent with previous shipments. Accurate: Precise process and quality control procedures ensure that each UHMW rod holder we produce is manufactured to your exact specifications. More Rigid: More rigid rod holder lips help keep rod surfaces cleaner during operation, especially smooth rods. More Durable: Due to its higher durometer and lower coefficient of friction, UHMW polyethylene holders tend to last longer. Better for specialty shapes: Since polyethylene is machined from a solid rectangular block, there are no upfront tooling or mold costs associated with small runs. Weather & chemical resistant: Impervious to ozone, sunlight, oxygen, and weather conditions; resists breakdowns from exposure to oil, grease, gasoline, and solvents. Longer life: Abrasion, tear resistance, and superior load-bearing capabilities lead to longer life. Our engineering team will work with you to customize long-lasting metering rods for your application. Call us or use our online form to request a quote. Buschman is the metering rod technology expert and premier supplier for the paper and converting industries. 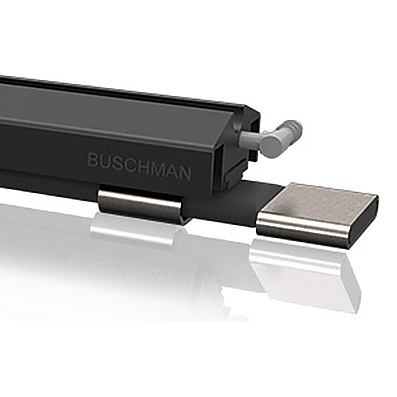 Buschman designs and manufactures custom-engineered metering rods, coating rods, rod holders, and provides Michelman spare parts and service to paper mills, paperboard mills, linerboard manufacturing plants, and converting plants. Buschman is headquartered in Cleveland, Ohio, USA and has representatives around the world.